Our knowledgeable staff is available to help you through evaluation & treatment of skin diseases. 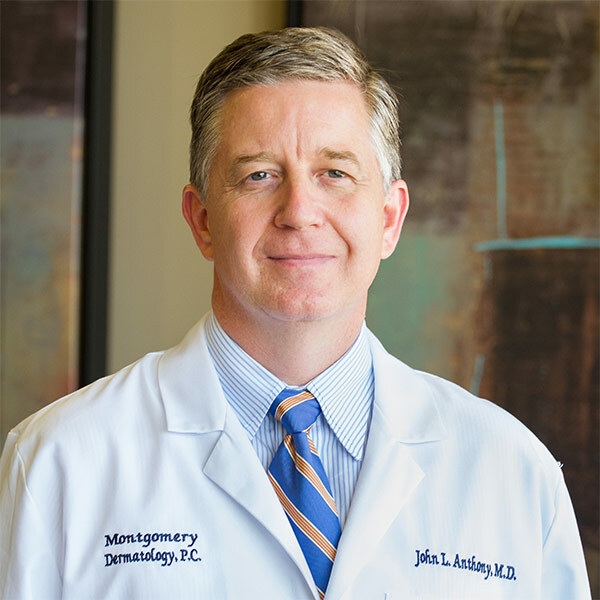 Dr. John Anthony is originally from El Dorado, Arkansas. He moved to Montgomery in 1995. He completed four years of service with the United States Air Force at Maxwell Air Force Base before entering private practice in 1999. He attended the University of Virginia and graduated with a Bachelor of Arts degree in History. He attended medical school at the University of Arkansas for Medical Sciences in Little Rock, Arkansas. He completed an internship in internal medicine and a residency in dermatology at the University of Arkansas for Medical Sciences. Dr. Anthony is board certified in dermatology.